First job: After finishing university, I worked as a design/project engineer for an injection moulding business in Lancashire. 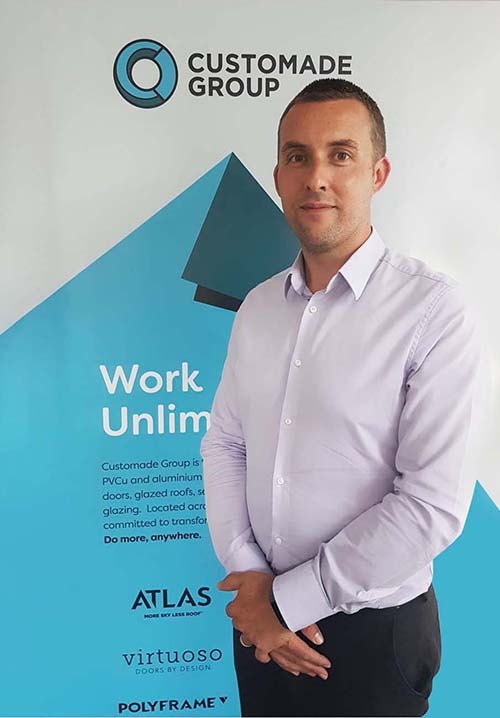 When did you join current company: I joined Customade Group in January this year after a 14-year career at Ultraframe and two years at Kawneer, where I was first introduced to the aluminium window and door industry. Most useful/favourite gadget: I know everyone says this, but it is my iPhone. I have all my contacts, emails and calendar in one place and the camera is invaluable for taking photos of products at varying stages of development. Most useful website: www.engineersedge.com appeals to my techy brain! It’s a great reference for any engineering challenges and I learn something new every time I use it. Business person you most admire: John Cookson, who is Commercial Manager for new markets at Kawneer. He was an inspiring person to work with when I was heading up product development at Kawneer. Recommended hotel for business: The usual chain hotels are great, but my overall favourite hotel is The Vermont in Newcastle – it’s an amazing place. Favourite UK restaurant: I’ve dined at some great places, but as it’s local to me, I have to say The Eagle at Barrow in the Ribble Valley. It serves wonderful food. Best business decision: My passion is to invent. To do that well you need a lot of knowledge and you mustn’t be afraid to take risks. I’m glad I took the time to broaden my experience and product knowledge in the fenestration industry to give me the skills and courage to create new products. Working Day: I like to be in the office by 7.30am so I can catch up on things while it’s still quiet. Throughout the day, I’ll be in touch with the technical managers and managing directors of the businesses within Customade Group. We discuss any ongoing projects and decide what support may be needed to ensure that they all run to schedule. I currently have 17 projects on the go, so it’s fast paced and demanding but also really exciting. My head is always brimming with ideas and I never want to forget them, so I always carry a small drawing pad with me to sketch things during the day. I can take inspiration from something at any moment and I like to make sure I capture these thoughts. My pad is absolutely essential to me – I’ve been known to keep it beside the bed in case any ideas pop into my head during the night! I’ve only been with the Customade Group since January, so I can’t talk specifically about performance over the last 12 months. However, following the various acquisitions within the group, it’s clear to everyone in the industry that Customade Group has achieved phenomenal growth. The group’s success is particularly notable within the aluminium and composite door sectors, which reflects the growing trend in the marketplace for more contemporary high-end-looking products. Customade Group is one of the fastest growing and most successful businesses in the industry and we have a bold ambition to grow the company significantly over the next 12 months. As a market leader, we naturally intend to build further scale, but we also want to be ‘best in class’ by delivering the products and levels of service that customers expect. Customade is a leader in the industry and I’m really excited to be involved in this phase in the group’s development. Our core focus is to perfect the Customade Group range by continuing to develop our already successful products and bring in new innovations that will help our customers to achieve long-term success. The market is constantly changing and evolving and, as a business, we need to be ahead of the game and ready to adapt to suit this changing market. Customers demand choice, quality, value and service and our strategy is very much about offering the best choice of products, materials and price points through one single relationship to help them succeed. Like any manufacturer, rising commodity prices and inflation can have a significant impact on us, but through our continuous development programmes, we look to mitigate this without impacting on our customers. Having spent 14 years working in the glazed roofing industry and two years in the aluminium window and door industry before joining Customade Group, I bring many years front-line experience within NPD. As a group, we now have many exciting plans to enhance our impressive product range to support our future business growth and I’m delighted to be involved in this. We want to ensure that our customers receive the best possible quality, security and performance, so testing products plays a huge part in developing the group’s range. All of our products are currently BSI Kitemarked and a large proportion are registered with Secured by Design, following the enhanced security testing to PAS24. I do like to attend the testing where possible at the various UKAS-accredited test facilities to help me understand where we can make improvements to products. You have to expect a certain amount of trial and error during the testing sessions, but thankfully I do really enjoy the challenge! Likewise, liaising with the sales team and listening to customer requirements is critical throughout any project – we need to know that we’re offering the right solution to the market and that we’re satisfying any customer needs. We’re passionate about getting everything right for our customers – it’s what really motivates us – and their feedback is essential in helping us not just to make products that work but also to make their lives easier. As a business, there is a significant focus on developing existing products and extending our diverse range and we already have several projects in the pipeline. Aluminium is, of course, a rapid growth area but customers still demand modern PVC-U products and we are currently working on a new window that will be available on two of profiles from Polyframe. This will be unveiled in the summer and we’re so enthusiastic about extending our market-leading range for customers. Virtuoso Doors is a fast-growing premium brand that’s developed a reputation for exceptional quality and manufacturing precision. The VirtuAL aluminium textured composite door was the first of its kind in the UK is now a top seller. But we’re not stopping there and we’re all set to launch something that takes this door to a whole new level in the very near future. The Atlas roof is renowned for its contemporary aesthetics, slim sightlines and thermal efficiency and it never stands still for long. We’re breaking more boundaries and currently working on some enhancements to further improve its thermal performance and reduce the sightlines even more. We know that homeowners will fall for this and it’s definitely something to look out for! The Atlas Flat Rooflight has been a tremendous success too with homeowners and installers remarking on just how good it looks. Thanks to its bespoke structural PVC-U welded internal core and sleek aluminium internal and external capping, the Flat Rooflight also delivers the best thermal performance on the market for a double-glazed flat rooflight. And now, with the introduction of our ingenious new click-on corner sections that will eliminate the need for adhesive, it will be easier and quicker to fit than ever before. With its amazing slim sightlines and large expanses of structurally bonded glass, our high-end architect specified Fineline Aluminium brand continues to dazzle the homeowner. The product is currently going through some exciting development work, which will help to position it as the market leader within the premium fenestration market. Customers are at the heart of Customade Group and we will continue to evolve and develop new solutions to help both us and them to stay ahead. Driving NPD forward benefits the industry as a whole; breaking new ground for customers and homeowners and bringing them more choice than they’ve ever had before. I’m really excited to be at the forefront of this movement and helping to advance the industry so that it can be the best that it can be. This is a key driver for us and our customers can expect us to work very hard to deliver innovation in everything we do. So, what does the future hold? At the forefront of the industry, Customade Group will continue to research into new technologies, materials and manufacturing methods to help the business to grow, become more efficient and serve customers even better. We will also continue to build upon our already established strong brands and further develop and refine our aluminium product offering. Although the group has a very broad range of products, we know that there are always opportunities to fill gaps in our portfolio. We’re constantly monitoring our offering and launching new innovations to maintain our lead in the market. Similarly, we are always looking at ways to improve our customers’ experience of our products and service and we will continue to use their feedback and our own market research to drive ongoing developments. The opportunities for development are endless and Customade Group is investing an enormous amount of time and resources to ensure it leads the market both in delivering incredible products and unbeatable service. Underpinning the business is a very talented and experienced team of people who are all dedicated to delivering what customers want, when they want it. We must never lose sight of the customer, so it’s my job to develop products that are relevant to them. It’s about giving them a suite of products that they can be proud of and all the support they need to grow their business. We have more resources, skills and expertise than any other supplier and we’re proud to be flying the flag for our customers. Luckily, I relish the chance to put myself in the homeowners’ shoes and to invent products that satisfy their desires, so this will be an exciting journey for me!